KULTURA A KAŽDODENNÍ ŽIVOT V RANÉM NOVOVĚKU III. For more than three decades, Zig Ziglar, one of the great motivators of our age, has travelled the world, encouraging, uplifting, and inspiring audiences. 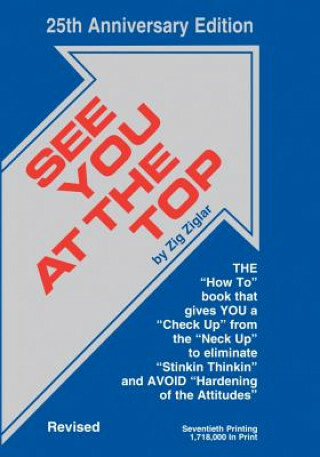 His ground-breaking best-seller, See You at the Top, remains an authentic American classic. Its basic premise-you can get everything in life you want if you help enough other people get what they want -- has guided generations of readers to personal success. This revised and updated edition stresses the importance of honesty, loyalty, faith, integrity, and strong personal character. It emphasises the value of a healthy self-image and shows how to build it. Personal goals are an essential part of any program for success. This important book tells you how to set -- and achieve -- those goals, and provides step-by-step instructions of how to change the way you think about yourself and your surroundings. Also available as Audio package with 6 tapes.